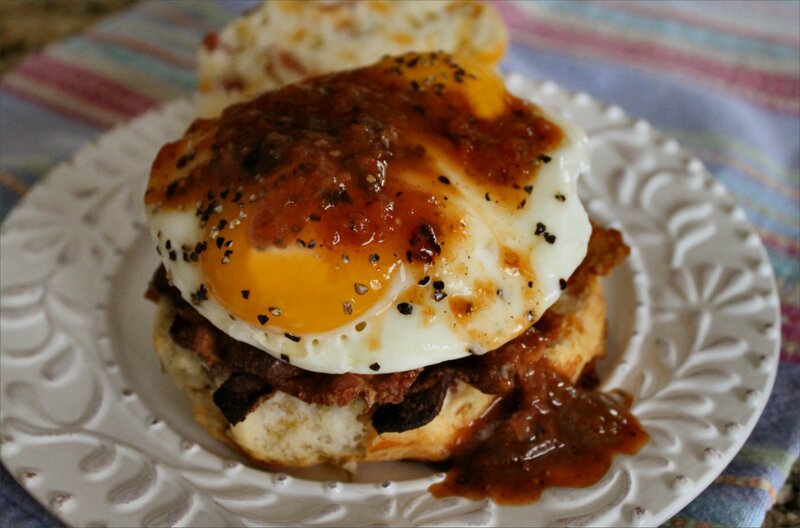 Texas Brew Salsa, a hearty breakfast and a GIVEAWAY; what a morning! UPDATE: Congratulations to Wen, winner of our Texas Brew Salsa giveaway. Enjoy! Special thanks to Brenda Craig of Texas Brew Salsa. I very much appreciate her generous offer to make a reader’s salsa dreams come true. Nothing gives your day a swift kick in the pants like a rib-sticking breakfast smothered in salsa, am I right? And not just any salsa – Texas Brew Salsa from right here in the heart of Texas. Created and run by local salsa magnate Brenda Craig (she’ll get a kick out of that title), it’s a great example of Texas ingenuity and creativity. And honey, Texans know salsa. 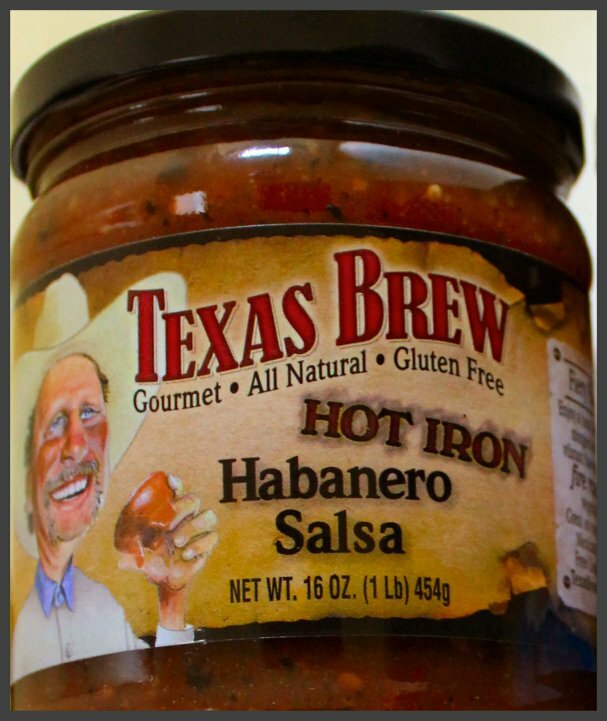 Texas Brew Salsa ingredients are roasted over an open fire for exceptional flavor. Better yet, they’re all natural. That ‘little something extra’ you’ll taste is honey. Varieties include Honey Roasted Chipotle, Honey Roasted Peach, Honey Roasted Pineapple, Honey Roasted Mango, Honey Roasted Apple Cinnamon, Hot Iron Habanero, Fire Roasted Poblano, and Fire Roasted Black Bean & Corn. Texas Brew is slightly sweet, and yet not too sweet and it’s highly addictive. We’ve tried it on just about everything – eggs, fish tacos, burgers, bean burritos and bag after bag of tortilla chips. Like I said, it’s addictive. I took this photo; that’s why the bottom right jar has some missing. Yum. Pre-heat your oven to 450F and line a baking sheet with parchment paper; set it aside. 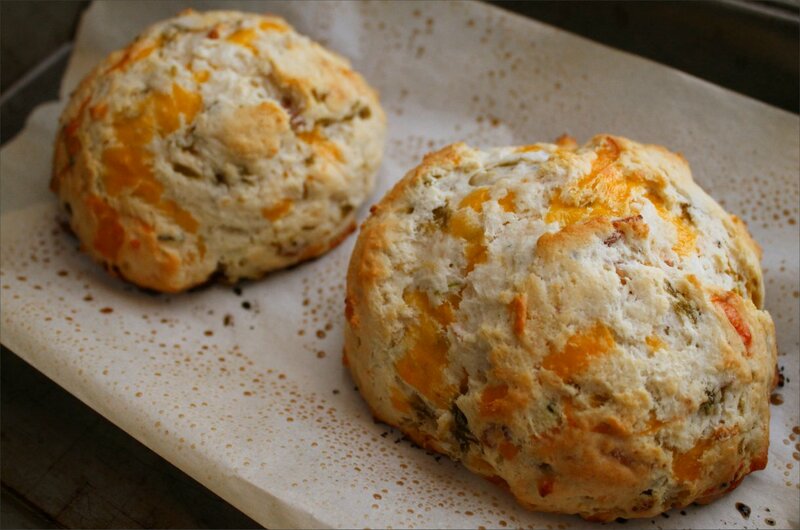 In a bowl, combine the baking mix, grated cheese, green chilies, bacon, pepper & salt; stir to combine. Gradually stir in 2/3 cup milk and blend just until the dry ingredients are incorporated; do not over mix. Using an ice cream scoop that has been lightly oiled, scoop biscuit mix onto the parchment paper. 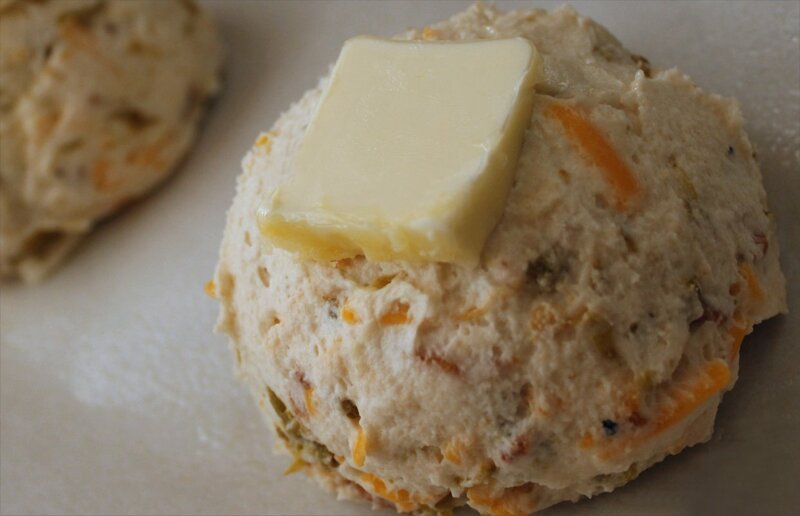 Place a pat of butter on top of each biscuit. Real butter, pretty please. Bake for 15-18 minutes (depending on the size of your biscuits) or until they turn a pale golden brown. Remove from the oven and allow them to cool before slicing to prevent them from falling apart. Biscuits can be tricky like that. Biscuits as big as your head, just out of the oven. Pretty! 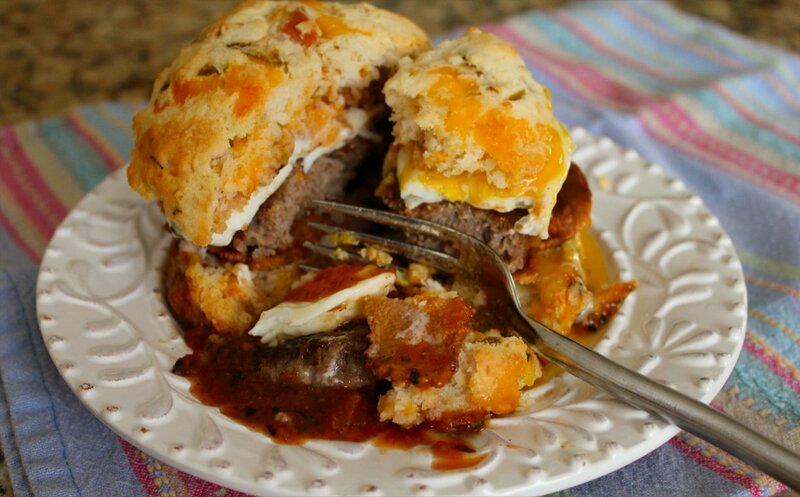 Carefully slice the biscuits in half and top each half with a schmear of butter, a generous helping of bacon or sausage (or both – your choice), and a soft fried egg or two. Slather the entire pile in Texas Brew Salsa (I used the poblano). 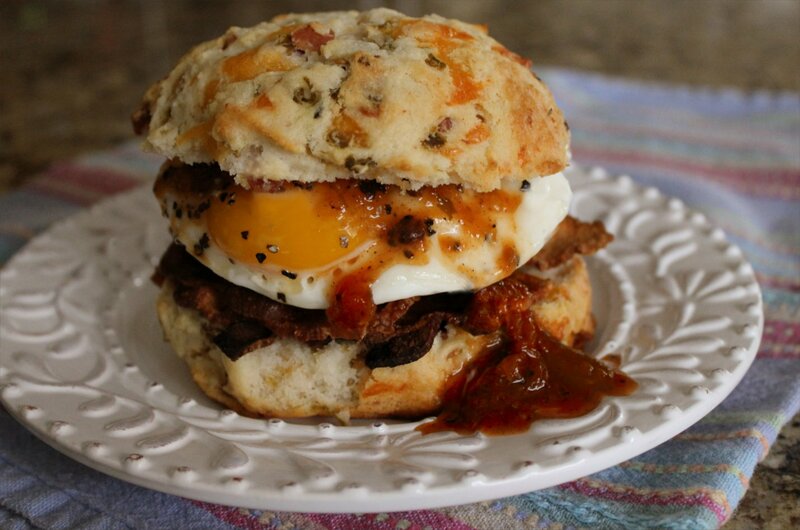 A bacon, egg & cheese biscuit is good, but salsa makes it so much better! This recipe makes two very large or 4 small biscuits. But this is Texas, so we make them big. Of course. I’m digging in. Would you like to join me? You’d better be hungry; this is one big biscuit! Leave a comment telling us what you’d make with Texas Brew Salsa or if you’d eat it straight out of the jar with a big bag of chips. This giveaway is for one variety pack of Texas Brew Salsa, including free shipping right to your door. This giveaway is open to Continental US residents only. It will run from Monday, October 1st, 2012, to 9:00 p.m., CST on Friday, October 5th, 2012. At that time, one winner will be chosen by random draw and notified by e-mail. He/she will have 48 hours to respond or another winner will be chosen. Now get to entering! You can’t win if you don’t! 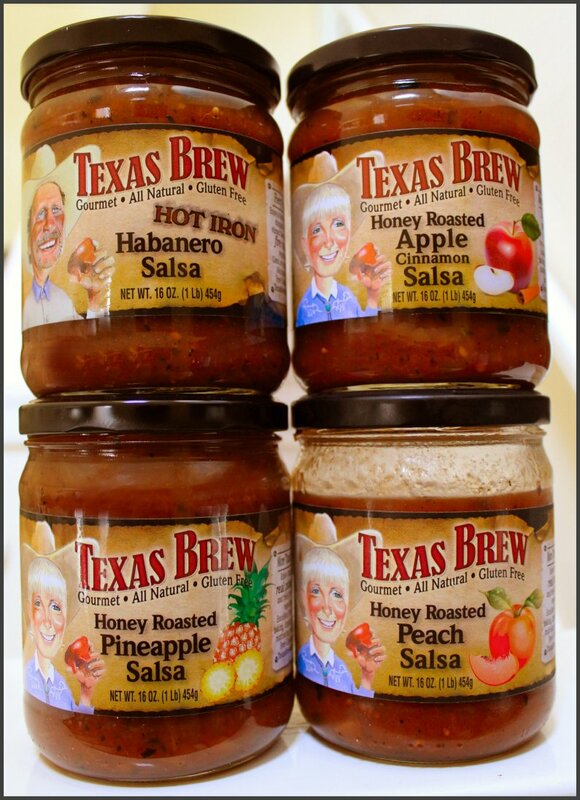 Texas Brew Salsa – getcha’ some! 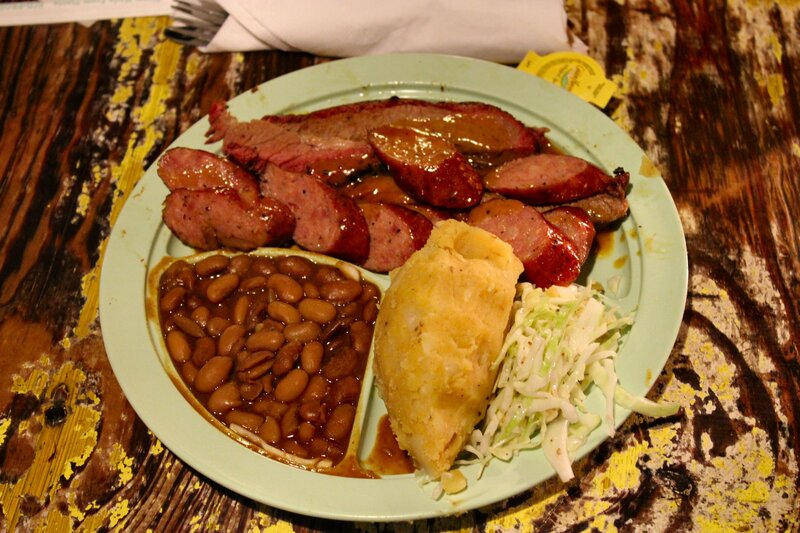 If smoked meat is your idea of heaven, the Salt Lick BBQ is the place! 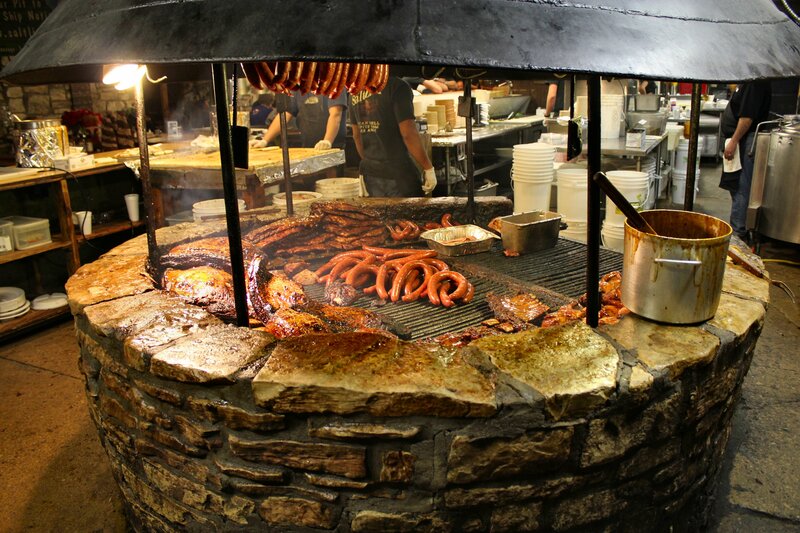 If you are lucky enough to live in the Austin area or the hill country around Austin and find yourself craving smokey meat, you owe it to yourself to visit the Salt Lick in Driftwood. It is the mecca of smoked meat and sweet, spicy sauce. And I love the atmosphere almost as much as the food. You can easily spend an evening sitting on the patio under the live oaks sharing cold beverages, local music, and great friends. It’s like hanging out at a neighbor’s house, if your neighbor had an enormous patio surrounded by hundred year old live oak trees right next to a world-class barbecue restaurant. A girl can dream, right? And like your friend’s house, you’ve invited to bring your own beer. Because the restaurant is located in a dry county, they allow guests to bring in their own beer. I recommend Shiner and/or a 6-pack of Dr Pepper. It’s a Texas tradition. scented coleslaw, the potatoes served in the shape of someone’s gloved hand, and the warm bread, sliced onions, and salty pickles that dot the table. I love that the worn farm tables look like something out of my great-grandmother’s barn. 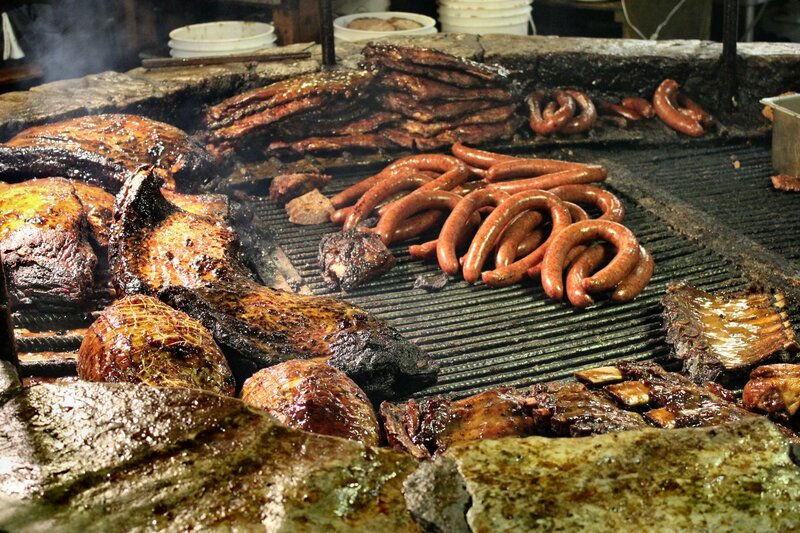 But nothing, and I mean NOTHING surpasses the meat at the Salt Lick. There’s not a bad batch of meat on the menu. The ribs fall off the bone, the sausage is flavorful, and the brisket is perfectly tender and wears that pink smoke-ring of perfection we Texans crave. The only thing that will keep you from stuffing yourself like a Thanksgiving turkey is the need to save room for cobbler. Your choices are peach and blackberry, both served with Blue Bell vanilla ice cream (on request). And since they’re both too awesome to choose one over the other, I recommend you get both. Just ask for extra spoons and be prepared to share. After a big meal, four people can easily share one serving of cobbler. If you’re dead set on only ordering one, I highly recommend the blackberry. My dinner - the sausage and brisket plate. I wish this photo was scratch-n-sniff. Before you leave, hit the small merchandise corner by the front door. They have great t-shirts and hats, but my favorite “take aways” are the sauces. They have really, really good sauce. Cross my heart. They also sell excellent dry rubs for the home chef. If you’re too far to visit but too fascinated to pass it up, they have an online store. If you’re close enough to visit, then by all means do. Pick a nice evening with cool temperatures and a great breeze. Stock an ice chest with cold beer or sodas for the kids. Throw a deck of cards or a board game in the car in case you decide to hang out in the courtyard before dinner. Skip lunch or eat light before you go, and don’t forget to wear your stretchy pants. Disclaimer: NanaBread is not tied to the Salt Lick BBQ in any way, even though she’d like to tie herself to one of those farm tables and stay until they run out of brisket and cobbler. She has never been compensated for providing feedback on the restaurant or their products. Ever. She just loves the place and can’t keep her big mouth shut. Big surprise. They’re right. Sometimes, early in the morning, I whisper “Aloha, Hawaiian Grog! I love you soooo much!” before I take that first sip. It’s really good stuff, especially if you’re a nut for coffee and coconut like me. Other flavors I plan to try soon: Almond Bliss, Angel Dust, Chocolate Crème Brule, Strudel Cake and Tiramisu. My winner for their most unique blend is “Lunch with Elvis.” That’s right…it’s a peanut butter and banana flavored coffee. Yes, I know it sounds bizarre, but I’ve tried it and it’s actually pretty good. Unexpected, for sure, but it’s good! You’ve got to give it to them – it’s pretty clever. 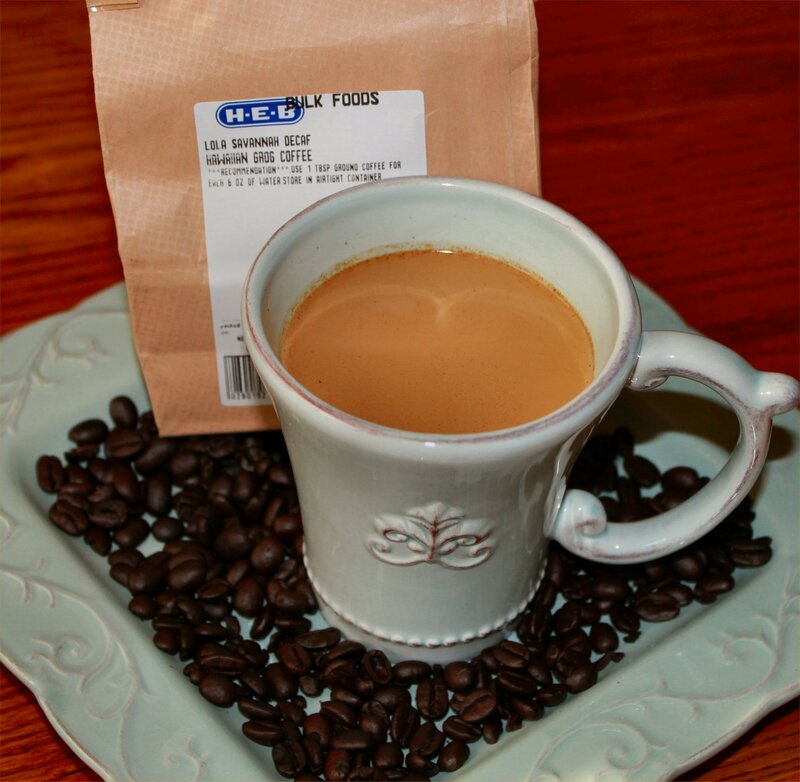 I like to buy my Lola Savannah coffee from the large bulk barrels at my local HEB Market so I can grind my own, but HEB also sells small foil packages so you can try other flavors in small batches. They can also be found in Central Market and Fiesta stores in south Texas. If you’re not from the Houston area and/or you don’t have access to an HEB market, don’t sweat it! If you’re more of a tea person than a coffee person, that’s okay too! They sell both! They have a really nice website with online ordering. They’re also thoughtful enough to include a page called “Coffee 101” to help you learn more about coffee in general, and a “Brewing Tips” tutorial to help you make that perfect cup of Joe. Intrigued yet? I hope so. They certainly got my attention, and now they’re a part of my morning routine. You can check them out at www.lolacc.com. 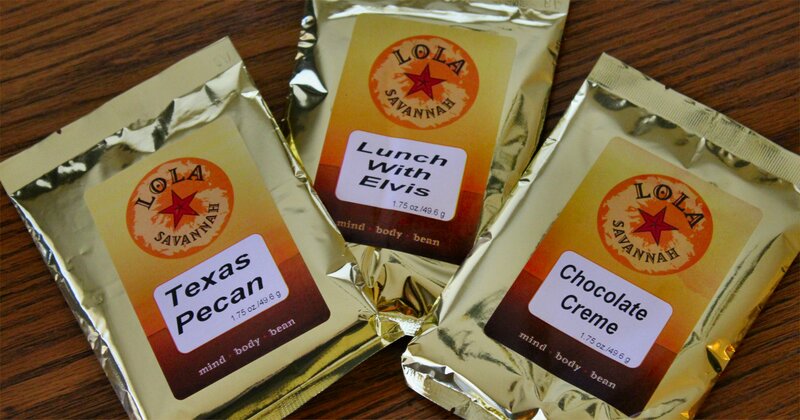 As a special treat for one lucky reader, I’m giving away three sample pouches of Lola Savannah coffee. The flavors are Texas Pecan, Lunch with Elvis, and Chocolate Creme. Leave a comment telling me your favorite flavor or type of coffee and where you get it. Be sure to include your e-mail address. All entries must be received by midnight Central Standard Time on Thursday, October 7, 2010. One winner will be chosen at random and notified by e-mail on Friday, October 8, 2010. I’ll post an update on the blog to announce the winner, as well. Disclaimer: The Lola Savannah Coffee Company of Houston, Texas has no earthly idea who in the tarnation NanaBread is, so it goes without saying that they have in no way compensated or bribed her to provide this endorsement. But that won’t stop her from buying her weekly pound of Hawaiian Grog and shooting her mouth off about it. The sample packs for the giveaway were purchased by NanaBread with her own cash money. That just proves how much she loves this stuff and how strongly she feels it must be shared with the coffee lovers of the world. Think of this as a public service announcement for fellow java junkies everywhere (12-step program not included). I’m starting with this one because The Complete Package and I both love it to pieces. I’m not joking when I say that I have one jar in the fridge and three in the pantry at this very moment. We’re addicted. We eat it on everything and anything, but it’s also great straight out of the jar on tortilla chips. It’s good stuff. Arriba Salsa - A Fiesta in a Jar! 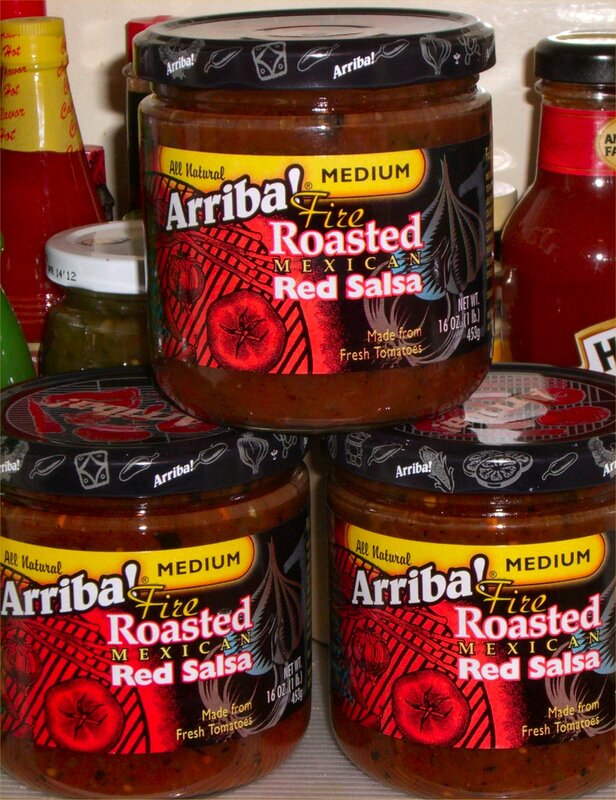 Our favorite is the “medium” fire roasted Mexican style red salsa. It’s a perfect balance of roasted tomato flavor and heat. Not too spicy, but not too wimpy. It’s made by Riba Foods in Houston. They make a wide variety of salsas including Mexican style, California style and Texas style. They also have a line of pickles, peppers and olives as well as drink mixes, dips and sauces. We just tried our first jar of their Texas Pepper Works Candy-Krisp pickles and they are awesome! They’re sweet spicy pickles with a cayenne and garlic kick. 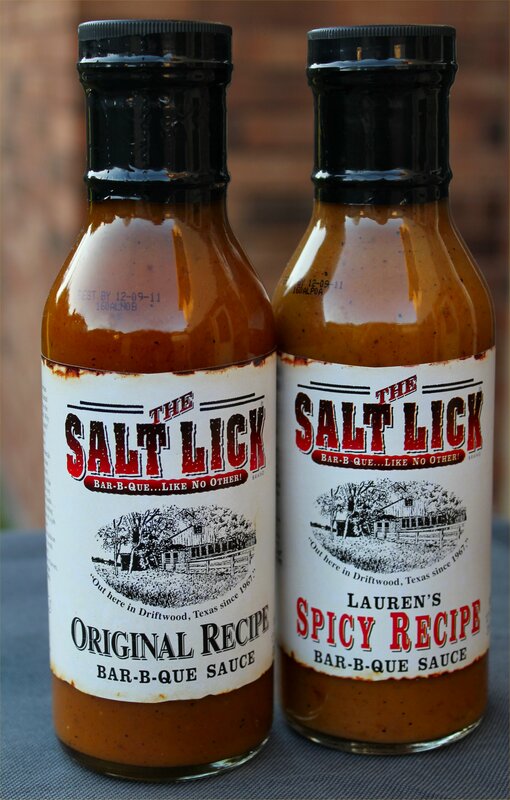 Like the label says – not too spicy, not too sweet. I could eat the whole jar. I might not be able to feel my lips afterwards, but I could do it. If you don’t live in Texas or the Houston area, don’t sweat it! You can order directly from their website if you can’t find them at your local grocer. Here’s the website; the rest is up to you.